A town meeting in Concord, Massachusetts recently voted in favour of banning bottled water from 1 January. Here Huw Kingston from Bundanoon, Australia - the first town in the world to go bottled-water-free - offers encouragement. I write to you from Bundanoon, a small town in Australia, a couple of hours south of Sydney. Some of you may know that last year we became the first town in the world to stop selling bottled water. We called our initiative Bundy On Tap. We're a bit smaller than Concord with a population of about 2,000. We're a town situated on the edge of a huge national park and a town that depends upon tourism. Last year I had the idea for the town to voluntarily give up the sale of bottled water. We had a well-informed community, given that we'd been fighting a water extraction plant for some years (a company wanted to truck 50 million litres a year from our aquifer to Sydney to stick in plastic bottles and then truck it around the country). Almost 12 months ago, we held a community meeting to look at how we could do it. It turned into the largest community meeting ever in our small town and resulted in a 355 to 1 vote in favour of getting rid of bottled water. We did this by convincing the local stores that they'd do better without bottled water. That the sale of refillable bottles, the increased tourism and increased support (by way of dollars across the counter) from the local community would more than make up for any loss of revenue. Our plan was to make public drinking water more available than ever before. We did this by installing four beautiful refill stations and water fountains across the town, including one at our local primary school. Also, many businesses installed chilled, filtered water units in their stores, cafes etc. 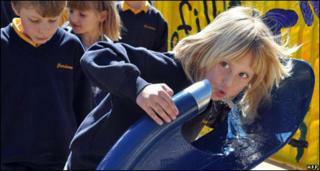 Bundanoon officially went bottled-water-free on 26 September last year, on a day of great celebration for all ages. We ran bottled-water-free events such as our big Scottish festival, with 15,000 visitors. Free water was on hand from "water bars" at the festival and from mobile backpacks dispensing chilled water to fill people's bottles or from paper cups. So easy. What we didn't account for was the massive worldwide coverage our plan received. Just about every major media outlet across the world covered the story. I did over 200 interviews in two days and town was crawling with TV crews from across the world. We had touched a nerve - a small community sending a message upwards. A message about the environment and a message about people making the right choices for themselves. Our state government followed by announcing the banning of bottled water that same day in all government premises. We received hundreds of messages of support from across the world. Dozens of communities and municipalities have asked advice on how to reduce their bottled water consumption. The bottled water industry was not very happy (of course) and has tried various initiatives to try to stop the bandwagon rolling on. But the movement grows, and you, good people of Concord, are part of it. You must understand that the industry may try to unsettle you and you must, above all, focus on having good public water sources on the streets and in the parks. With this, the argument that you are somehow forcing people to drink "sugary" drinks fails completely. If you can look down the main street of Concord and see a water fountain or two then you are on the right track. Tourists will love it, locals will love it. Have available refillable bottles in your stores and cafes. In Bundanoon we didn't actually "ban" bottled water. We have no legislation on it, no regulation. It is voluntary. In bigger towns such voluntary action becomes harder. It's harder to get every business on side. But remember, by just having good public water sources, you will automatically reduce the amount of bottled water sold. You will impact upon this most crazy and environmentally destructive of products - a product that is perhaps the ultimate manifestation of the consumer age. Selling people what they already can have almost for free - in bottles produced from oil, 70% of which are never recycled. So next Tuesday, 6 July, we gather again in our community hall for an anniversary party to celebrate a huge year for our small town. We will tell stories from around the world. Of the Facebook Page in Belgium with 3,000 members supporting a plan to make "I Bundanoon" a verb. Of school children in France learning of Bundanoon in their school books. Of the last bottles of bottled water from Bundanoon turning up for sale on eBay. We'll raise a glass of beautiful Bundy on Tap to Jean Hill and all you Concord residents. I'm sure you've got the bottle Concord. Go for it. I am turely inspired. Personally I bundanoon from now on. I teach primary science classes here and we cover water (the water cycle, its uses, conservation, etc) here as part of the curriculum. Our tap water is not really potable (it's desalinated and often tastes foul -boiling makes no difference) so we drink a lot of bottled water, even making coffee with it. Given that it is often very hot here too, it's essential that we do drink a lot of water. Unfortunately, we can only buy drinking water in plastic bottles. Even so, there are ways we could cut down on plastic usage -I use metal bottles or reuse plastic ones until they become useless (making sure they are properly cleaned, of course!) So far, we have dealt with saving water in class, but never the issue of plastic bottles. I shall introduce it as part of the unit next year. Our kids already have recycling and environmental impact as part of their learning, and this is an obvious part of that. It's a shame we have no alternative source of drinking water but we can still cut down. All I would want to know is this, .... does the municipal water system of Bundanoon add fluoride to its water? I hear Australia is one of the worst governments in the world to convince of the adverse health effects of fluoridation and one of the very few countries left in the world that continues this insidious practice. So, if you add fluoride, you have not solved a problem even worse and more far ranging than the plastic bottle. Germany introduced a mandatory deposit for all bottled water, carbonated beverages and beer in 2003. It was a disaster at first because the bottling companies resisted implementation and failed to put systems in place to take back the empties, but it has settled in now and means that almost all water bottles are refilled or recycled. This is a brilliant example of power to the people as we used to regularly enjoy in America. I was warned in Chemistry class years ago that water sold in plastic bottles made no sense: it's yet more plastic trashing the environment, and who knows how much of those plastics leach into the water that goes down your throat? May Cocord, Mass. be as sucessful as Bundanoon, and spread your movement everywhere. Let's take power back from the corporations! I sincerely hope they don't do it in Europe, especially in France and the UK. I am also against water in plastic bottles that just go to land fill. In Germany, most of the bottled water is in glass bottles and there is a deposit on them. Even the plastic bottles have a deposit on them and they get shredded. What a GREAT initiative. Congratulations to the residents of Bundanoon and good luck to those in Concord. I am a tap water drinker - I always keep full bottles of tap water in fridge and fill up smaller drinking bottles from them when I go out. The marketing of bottled water companies has certainly been hugely successful in persuading people it is the only water to drink but what a huge negative impact it has had on our environment - for generations to come. When will concern for our world take precedence over company profits? Yes, that was rhetorical as I know it will never happen! But we as individuals can all do our part in trying to overturn that trend. I hope this article is an inspiration for other towns to follow the examples of Bundanoon and Concord. I live in South Africa where we as a nation have some of the best drinking water in the world (I think the statistic is 1 of 10 countries where you are able do this- drink out the tap which is safe) and yet some still buy and drink bottled water - its a fad and unnecessary! I so wish this campaign would take off here in SA it woudl alsomake for a great deal less plastic litter (of which we have too muchhere in Africa).There is no need to drink bottled water. Well done on a great initiative. This is the daftest idea I have ever heard, and I live in a Democrat-controlled state. Research as shown that many bottled waters have more contaminants than water from the tap. Some companies even fill from their local taps and others add caffeine, acetaminophen and/or minerals for taste enhancement, energy or imply their water makes you feel better. I am allergic to acetaminophen and have stopped drinking bottled water as I do not want to read the label every time I would get a bottle. Some states have put a deposit tax on the bottles to insure recycling. At home we use a Pur filter at the tap and the water is great. The price is great & I don't have to worry with the landfill issues. This is a do-able plan and we can go a little "greener" by this simple move. I have to laugh at the demonisation of bottled water. Why do soft drinks manufacturers not get the same attention, as these bottled drinks are not only worse for the environment (as producing those drinks requires more energy than simply water), but also worse for one's health. Sure, one can't get, say, those drinks from a tap at home, but soft drinks are just as easily replaceable with tap water as bottled water!? Hats off to the citizens of Bundanoon! Water in plastic bottles is a an amazing smack in the face to the ideals of the three 'R's. How is it possible for people to be so dumb as to believe that the water in plastic bottles is better than the water in most municipalities water systems? Do they know that plastic bottles have chemicals which can leach into the water especially when the water warms up? Do they understand the real damage done to the environment? These modern conveniences are something we can definitely live without. The governments have given way to pressure over smoking and created bans in public places, so why the heck can't they ban these nuisance and potentially dangerous bottles? If bottled water is the ultimate manifestation of the consumer age, then this wonderful letter of support from Bundanoon to Concord must be the ultimate manifestation of the information age. Congratulations to Bundanoon and best of luck to Concord! We all need water...just not sold to us one bottle at a time. When I travel I get ill if I drink local water, and I know many other people who have the same problem. If I cannot buy bottled water in a town I have no choice but to avoid it. Good luck Concord and congratulations Bundanoon! Disposable plastic water bottles are nonsensical luxury. People erroneously believe the water in those bottles is cleaner, more healthy that the municipal water supply, when often times those bottles are filled from municipal water supplies! So what does bottled water represent? A clever marketing campaign to get people to pay $1.50 (US dollars) for a product available for $0.01 fro the household tap. As an outdoorsman and fisherman, I'm appalled by the number of water and carbonated beverage bottle that I see washed into our local streams, lake, rivers and bays. Good luck Concord, and I hope your good example is embraced by more US cities! I'm not sure an outright ban is necessarily the way to go. As in many other situations, moderation and flexibility can yield better results. Why not utilize market forces and impose taxes to raise the price and achieve a reduction while still allowing individuals to make their own choices? I've dramatically reduced my consumption of bottled beverages (not just water) over the past three years, primarily for reasons of economy. I have a filter in my refrigerator, a glass on my desk at work, and a teapot on my counter. I also have a couple of cases of bottled water in my pantry in case of emergency. While I recognize that I can store my own water in the case of a forecasted storm or other emergency which may interrupt the local water supply, there have been situations in the U.S. in which water was abruptly shut off to a large region without notice. I prefer to have water on hand, and, perhaps foolishly, I trust the commercial companies to seal water so that there won't be bacterial contamination far more than I trust myself. If bottled water were banned, I could not as readily keep the recommended 72-hour emergency supply on hand. Superb letter. There is a great deal of "urban myth" about bottled water - several months after the Chernobyl incident I was waiting in the queue behind a woman in a supermarket here in Greece who was buying a large number of six-packs of bottled water and the cashier commented on the quantity of bottles. The woman buying the water said that she was buying it in such large quantities because she didn't want to drink radioactive tap water... I felt like asking her if she thought the bottled water she was buying had been shipped in from Jupiter. Tap water throughout the vast majority of Europe is perfectly drinkable, and what's more the differing taste of tap waters in different parts of Europe (due to varying mineral content) adds to its attraction. Did you know that Coca-Cola considers water it's greatest competitor? I wonder how this could back-fire and cause people to buy more carbonated sweet drinks - if only for the convenience factor of having a light disposable container to quench one's thirst whenever needed. It's a very important news. I live near Umbria and we have a good water. But people still buy bottle water that comes from countries thousands of miles away. You think how much energy waste and pollution as. People need to learn to drink tap water. alexa penzner, new york, NY, U.S.A.